The 5th Floor began in 2009 as a reaction to the burgeoning interest in Fixed Gear cycling worldwide yet with a UK centric voice. Originally an online editorial The 5th Floor has developed and grown in parallel with the collective of individuals that contributes to its endeavors as well as reacting to external trends within the cycling and online community. 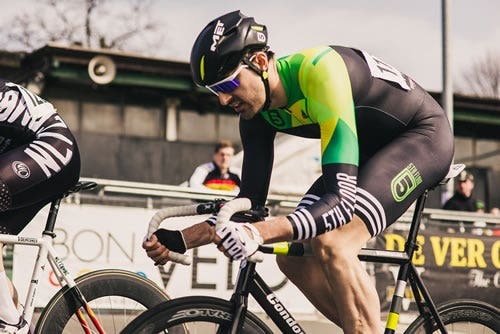 From providing a voice for a cycling movement, brand consultancy and collaboration, to providing a successful platform for advertising through to establishing competitive race teams in both the UK and USA that subvert traditional constructs in pursuit of their own values; The 5th Floor has done it all. We have many aims for this forthcoming road, track, mountain bike and cross season, both on the bike in terms of races and indeed result - but also off. Amongst those are a continued promotion of community, creativity and a desire to build on collaborative relationships. Our principles and endeavors have always been to work with like-minded companies and engender valuable and reciprocal relationships. In summary we seek an atypical sponsorship relationship that’s about what can we achieve together not what can we get from you. Our team is made up of a small number of individuals who really seek something different from the definitive cycling team or club. I've had a chance to see the ELEMNT in person very briefly. Aside from a new and refreshing interface, the GPS/map function is what I'm excited the most. Especially for someone who likes to explore new roads. I imagine the ELEMNT upgrade from my Garmin Edge 800 to the ELEMNT to be a similar experience to when I switched from a flip phone to an Apple iPhone. Most excited for a legitimate new player in the cycling computer scene as well as the seamless smartphone integration. My primary use for the ELEMNT will be training with power as well as the mapping feature so I don't get lost when I move to the burbs.